How could any chocolate cake not be made better with sweet, crunchy toffee bits? This recipe is my "go-to" chocolate cake recipe. I used to always buy boxed chocolate cake mixes. But, I always have the ingredients on hand for this cake - and it's so much better than boxed cake. 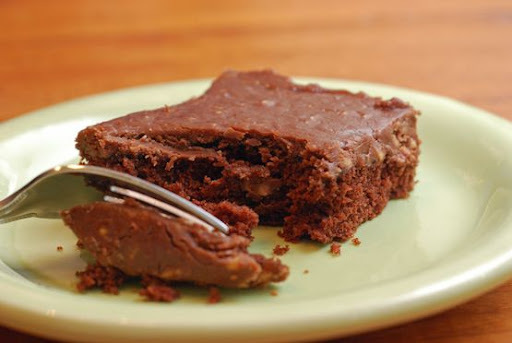 Traditional Texas chocolate sheet cake has chopped nuts in the frosting. But, the more I cook and bake and get feedback from you (my faithful readers and friends and family! ), the more I realize that a lot of people just don't like nuts in their baked goods. But, because this cake is so fudgy and soft, it needs a little crunch. It wants a little crunch. So, I make a simple chocolate butter frosting, and add a bag of toffee bits. And, the result? A delicious, chocolate cake with a crunchy, buttery chocolate frosting. And, I get to take a cake to one of my friends, or a new Momma, or a family that needs some home-baked love. If you want to make one large cake in a jelly roll pan, you can. But, because this cake is so rich, one small pan is enough for even my chocolate-loving family. How about baking these cakes and taking some chocolate, homemade love to one of your friends this week? 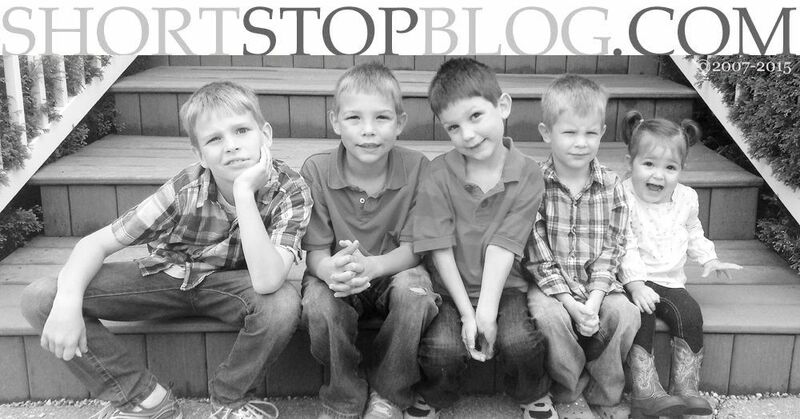 What a great way to surprise and bless someone else while still loving on your family, too! Combine flour, sugar, salt and baking soda in a large bowl. In a small measuring cup or bowl, combine eggs, milk, vinegar, and vanilla. Set aside. In a small bowl, mix butter, cocoa powder and water. Pour chocolate mixture over flour mixture. Stir to combine. Add egg/milk mixture and beat by hand until smooth. 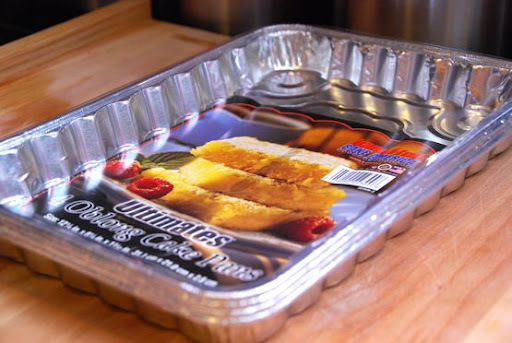 Pour mixture into 2 (1/2 jelly roll or 8" x 8" or 9" x 9") baking pans or into one jelly roll pan. Bake at 350 degrees for 20 minutes (25 minutes for 8" x 8" or 9" x 9" pans - or until toothpick inserted into center comes out clean). While cakes are baking, make frosting. Melt butter, milk, and cocoa powder in a small saucepan on stove over low heat just until mixture comes to a boil. Remove from heat. Add vanilla. Stir to combine. Add powdered sugar and mix until smooth. 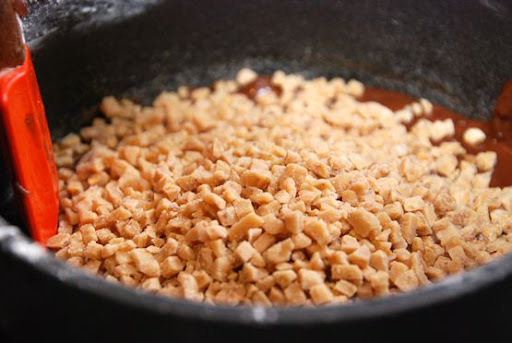 Add toffee bits and stir to combine. Spoon frosting over warm cakes. Spread until smooth. 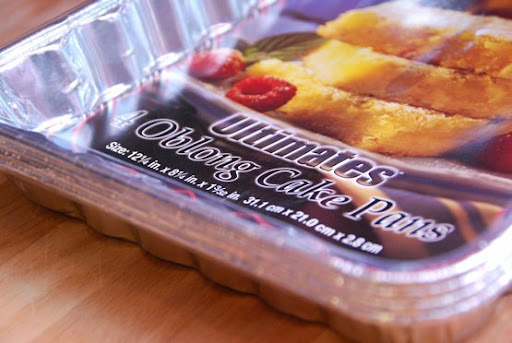 Serve cakes warm or room temperature. 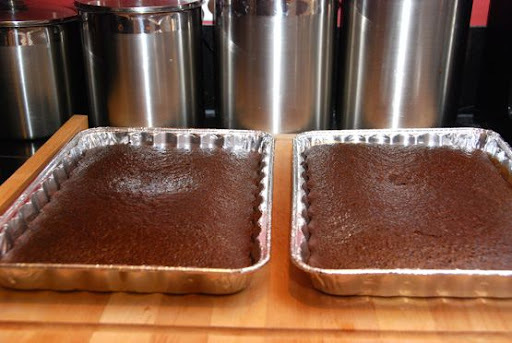 These cake pans are 12 1/4" x 8 1/4" x 1 3/32". I'll add in another picture that shows the pans sizes up close. I've never thought of using those toffee bits for this. I've used them before though and they are great. Thanks for the idea! My moms used to make this cake with chocolate frosting with cherry in the cake. 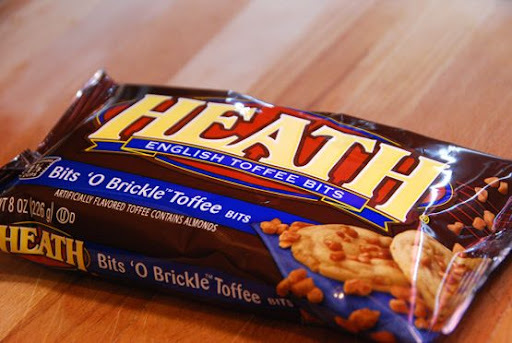 Hmmm, I love nuts and David loves heath. Two cakes, two people, two different taste preferences. Do you see a pattern here for what to do with those TWO cakes? LOL Sad part is, I would eat the WHOLE stinkin' cake and Dave would eat one piece. 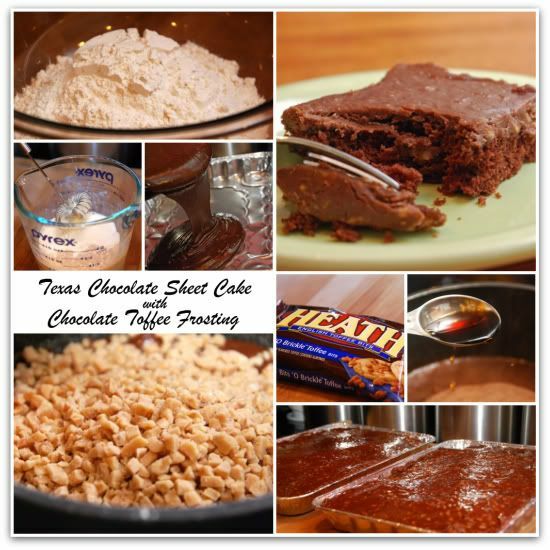 I love Texas Sheet Cake- I've never added the toffee and it looks so good! This cake always reminds me of my mom- she made it a lot. I wish I could go through the computer- I'd love a bite of that right now!! I double the icing when I make Texas Sheet Cake b/c it's so fudgy and yummy. Zak knows I'm hormonal when he comes home from work and I'm making a Texas Sheet cake and serve it as our dinner. I don't really feel like commenting the chocolate + fudge cake, which I know I would probably looooooove (I'm trying to get started - again? - on a diet today). Just stopped by to say how much I enjoy reading your blog (I'm becoming addicted), and that I am seriously considering the possibility of copying your idea of baking a cookie advent calendar. Have a great week! We had so much fun with that last year. I hope you do it, and enjoy it as much as we did! Okay. I have just gained ten pounds by looking but it is all worth it! I am definitely going for a Texas sheet cake on Tuesday evening when I have guests--and including the toffee. What is not to like about that! Where could I find a dish like the one you your apple crisp was in? You had me at *hello*! Totally baking two of these and taking to a friend, just like you said! My neighbor really could use this but she is allergic to chocolate.... can you even IMAGINE? yuuuummmm! making pumpkin cupcakes for a brunch; I'm thinking about putting that icing on them. I just want you to know that reading this recipe forced me to make fudge. Forced me. It looks delicious!!! I wish my oven wasn't broken! Got a new oven last week. Made this cake last night. I ate so much of the frosting before the cake was done that I couldn't even eat the cake when it was ready. I ate some cake for breakfast this morning. Delicious! But, really, how could it not be delicious? It's got 3.5 sticks of butter. And the frosting has 3.5 cups of powdered sugar! The cake goes down like... like buttah!